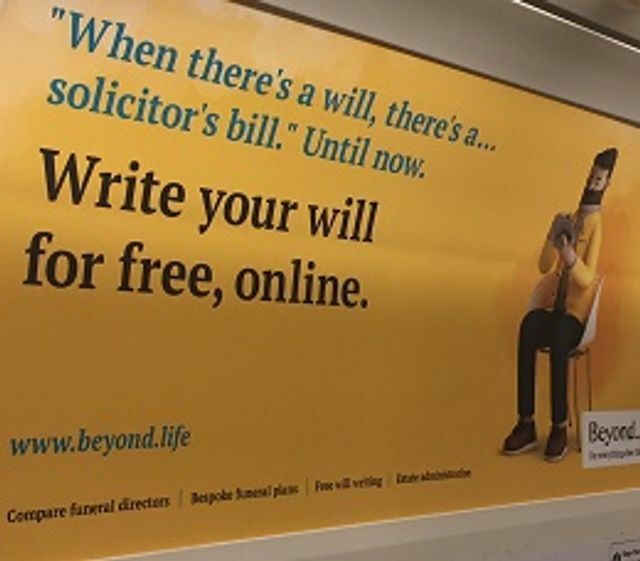 Beyond.life has received raised eyebrows over a free online wills service which it is offering. Many of those involved in Will writing will be concerned about this for a number of reasons. Meeting face to face with a client is so important. As practitioners will know, a general chat can result in an apparently simple case turning out to be much more complex than initially thought. Perhaps a client's responses will lead you to question capacity, maybe the presence of an overbearing child may raise the issue of undue influence or an off-hand remark about helping out a sibling could indicate a potential Inheritance (Provision for Family and Dependants) Act 1975 claim. It is not entirely clear how a free Will done via an algorithm could address these potential problems. However, it is well documented that a large number of adults do not have a valid Will in place and it could be said that anything that encourages more people to do so should be welcomed. As the article notes, for a generation used to living an online life, in theory, this sort of product might well be appealing. Having said that, there are some doubts as to whether or not cost and time are the main reasons for the number of people dying intestate. After all, a large number of elderly people of reasonable means and lots of spare time die each year without a Will. It could be argued that those who do not make a Will do not wish to think about death/tempt fate or believe the intestacy rules are adequate for their situation. For those cases, a free online service would perhaps not encourage Will making. “It’s important to understand that we don’t see our will-writing service as a substitute for solicitors and complex wills, we see our service as the legally-binding way of creating a simple will. “We use a solicitor approved-template for our wills, just like solicitors would do to write up a simple will, the only difference is that ours is free of charge. “Why should people pay for something that doesn’t take any time and effort to produce?” Ms Traykova said the service was “perfect for millennials who are short of cash and prefer handling their affairs online”. She added: “Quite frankly, the vast majority of young people, say with a newborn or just after getting a house, are not going to have the time or cash to go and sit with a solicitor to make a bespoke will."